The internet has been unusually quiet of late in terms of new music that sounds interesting. I have lots of albums to review backed up in my iTunes, but I, like most of you no doubt, like some variety. This is why I almost always listen to my iPod on random. Sure, you get some funky combinations, but I'll take that variety. So, in the name of variety, I'm starting up randomness posts. I go through my iTunes library and scroll with my eyes closed, then click on something with my eyes still closed. Whatever I click on, I blog about. Boy, this sure is fun! And I'm a sucker for randomness. What can I say? That I once told someone out of the blue that I've never had anyone under the age of 13 hit on me? 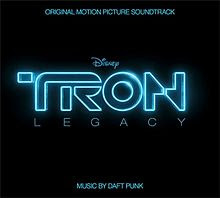 Today's Randomess: Daft Punk's Tron: Legacy soundtrack. I loved the movie. I admit that when the previews for Disney's new Tron movie first came out, I groaned. See, some 80s movies were great, and others not so much. The original Tron fits the latter category. But it was better than anticipated and the 3D effects were great. Then, a few months ago, I stumbled onto the soundtrack. I love film music, so I decided to check it out. The fare I found was not at all in the vein of Daft Punk's studio albums, which are mostly house electronica. On this soundtrack, they successfully blend sweeping orchestral soundscapes with trippy electronica sounds. In this day and age, quite a few film composers do this, and to varying effects. Daft Punk, for having little film compositional experience, certainly bring spacy fire and emotion to the soundtrack.